KFI Seating 2100 right-handed tablet arm student chair desk offers a long-lasting plastic seat and steel rod frame. Sturdy sled base with floor glides. Available in multiple colors. KFI Seating 2100 tablet arm student chair desk features an injection molded textured polypropylene plastic seat and back. Right-handed tablet arm provides a useful writing surface and flips up for easy entering and exiting. Sturdy solid steel rod frame for added support. Stable sled base with protective floor glides. Hand hold for easy carrying. Weight capacity up to 400 lbs. 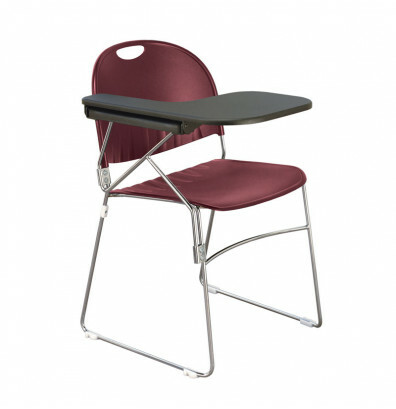 This KFI Seating student chair desk is available in black (P10), navy blue (P03), or burgundy (P07). Also available in a left-handed model (KFI Seating 2100).